During the second AI renaissance in the 1980s, researchers had a powerful language at their disposal. Lisp was the language of AI in the 80s, and there were even purpose-built machines built to run Lisp fast. You haven’t lived until you’ve had a Symbolics Lisp machine under your desk. Of course, AI died once someone realized you could make money on the Internet, and the idea of a machine designed to do Lisp died alongside. 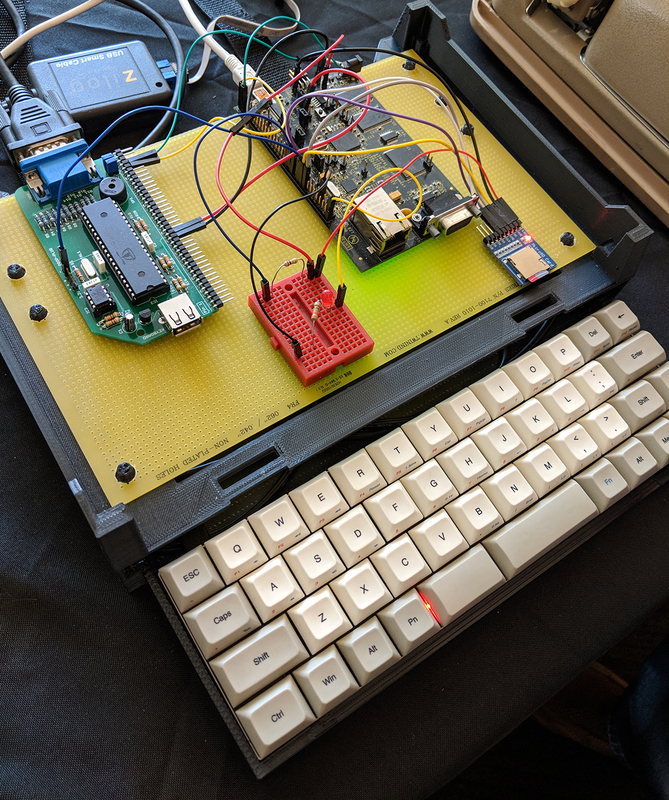 For his exhibit at VCF West, [Luther] presented his own design for a modern Lisp machine, and a great idea for homebrew computers in general. He’s developed a modular computer system that makes far more sense than a backplane design, and has a functional 3D printed enclosure. The hardware for the CP/Maker machine is a business card sized board with a Zilog eZ80 running at 50 MHz with 16Mb of RAM. A Propeller handles the VGA, while a PIC32 handles the keyboard and USB communications. That business-card sized board is rather unique for using the eZ80, as this is the first chip in the line to get an address space that makes sense. The software includes MakerLisp, [Luther]’s own dialect of Lisp, and an expanded CP/M system. Although the prototype system was shown at VCF West last weekend, [Luther] tells me the boards for the final revision are coming in and he should have a demo in about a week. The DEC microcomputers of the 70s are by far the most beautiful computers ever made. Not only were they capable and almost infinitely expandable, they all came clad in beautiful front panel artwork with Harvest Gold, Avocado, and Mauve color schemes. Yes, somewhere in Cambridge, Massachusetts an engineer said the word ‘mauve’. We’ve already seen a bunch of mini reproductions of classic mini and microcomputers, but the one we’ve been waiting for is finally out. At this year’s VCF West, [oscar] has one of the first production units of the PiDP 11/70. 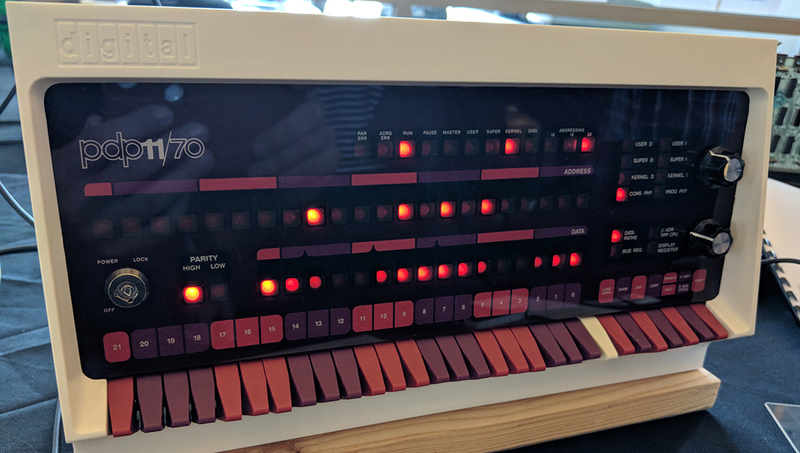 It’s a 6:10 scale reproduction of the famous PDP-11/70, the King of PDPs, and is clad in injection molded bezels, toggle switches, and astonishing front panel artwork. With a Raspberry Pi and SIMh, it’s also a completely functional replica of a PDP-11/70. Yes, you could probably connect to a vampire tap Ethernet network with this thing. I’m sure you could connect an RL02 disk drive somehow. This project is a follow-up to [Oscar]’s earlier PiDP-8/I project, a 2:3 scale reproduction of the PDP-8/I. Under the hood, the PiDP 8 is a Raspberry Pi plugged into a circuit board with a bunch of LEDs and switches, that completely emulates the experience of running a real DEC micro. The PiDP-11/70 is [oscar]’s latest project, and one that’s two years in the making. This modern recreation features an injection molded plastic bezel and toggle switch tips perfectly color matched to original DEC hardware. It’s a labor of love, and yes, you can buy one right now. [oscar] has already shipped 100 of these guys around the world, and there is a mailing list for anyone who would like to buy one. My EE department had a PDP-11/70. It ran RSX-11/M during the day. In retrospect, I can’t believe they let an emaciated zitty 20 year old undergrad exclaiming something about “UNIX” anywhere near it. i think we had a couple of those in our machine room, right next to the Pixars. It’s really a shame that nobody’s ever managed to get hold of a Pixar Image Computer in order to document and dump it so that it can be emulated and functionally preserved, rather than all known models simply bit-rotting away in museums. Says only 300 ever produced. Modern hardware probably leaves it in the dust. It can be ran through emulation, but it’s some hoops that needed to be jumped through. It would have been nice if OpenGenera had been open-sourced years ago. My all-too-brief Lisp machine experience was on a TI Explorer. By the time I was working on a commercial expert system project, the preferred hardware was a SPARCstation 1+. A modern workstation would run rings around the fastest Lisp machine hardware, even in emulation. So, what makes you miss your Symbolics? If it’s the software, why haven’t modern IDE’s caught up in all of this time? That’s a bold strategy, Benchoff. Let’s see if it pays off. I’m going with those Cray towers with the benches. But the PDPs are definitely lookers! Or Cray-2. No benches, but it comes with a waterfall. But I agree the DEV PDP-11 was a beautiful machine. They put some effort into their brand, from the logo, the 70’s rounded typeface and on to the industrial design of their equipment. I need a side by side, but the 11/70 is very nice. I worked in an 11/70 and then a VAX room at Boeing in the 1970’s and all the Dec cabinetry looks great. The tape drives and I/O racks for 64 or more current loop terminal interfaces and all that. The CPU front panel with the lights going is really nice. It all fits together for a look that says high tech and well matured equipment at the same time. When the system bogs down from a user (mostly programmers in this case) and you can’t figure who is causing the problem or even use the supervisor terminal, you can flip the run/halt switch until it halts in “user” space, enter all 0’s in that location (halt instruction), and then back to run. One person will complain that someone crashed their program and lost their work. Then you explain that they screwed up their code. Once I get the bugs ironed out in my time machine, I’m going to grab myself a slightly beat up original PDP/11 and a couple of amber screened DEC VT220s from a dumpster I saw back in the days when they were chucking these things out. I think the VT220 was the best looking terminal ever..
And grab as many of those plastic toggles switches you can find! A friend of mine built a time machine when he was 27 and got in. He didn’t ‘go anywhere and looked 80 when he stepped out. Now the problem is building a reverse time machine! I’m sure the problem with building the Reverse Time Machine (RTM) is he keeps forgetting what he is supposed to do next, kind of like when I step into the shop to get a tool. The boards have been back for about a week now … and they work ! We’ll be at the San Diego Maker Faire in October.